The central panel of a mural by Arturo García Bustos depicts events in the independent era. The former State Capital Building was remodeled and opened on March 21, 2008 as the Museo del Palacio Espacio de la Diversidad. Still commonly called the Palacio de Gobierno or Governor’s Palace, in joint collaboration with UNAM (National Autonomous University of Mexico), it hosts cultural activities, science exhibits, art exhibitions and entertainment. Its main façade, Doric in style and built from the green stone of Oaxaca, faces north, towards the Plaza de la Constitucion or Zocalo. The interior is divided into three courtyards that have been covered with a tent roof to make it possible to use the space for exhibitions. At the top of the main staircase there is an impressive mural painted in 1980 by the Mexican muralist Arturo García Bustos. The mural has three panels that depict historical and mythical events of Oaxaca City. The left wall expresses pre-Hispanic times, reflecting the customs and lifestyle of the Mixtec, Zapotec, and Mexica. The right wall depicts the Spanish Conquest. 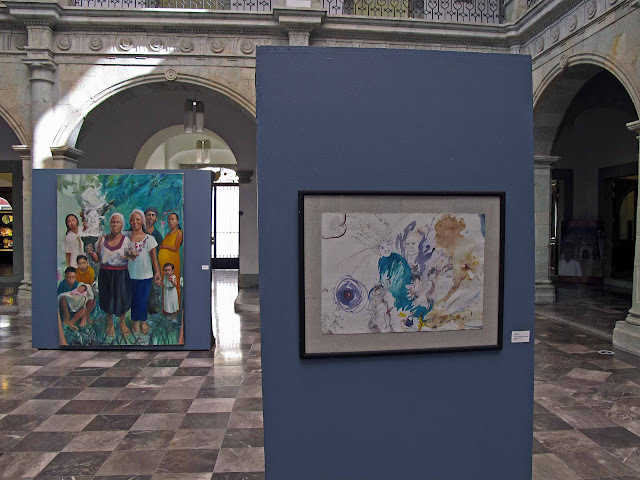 The central wall depicts events in the independent era including a picture of José Maria Morelos y Pavon, printing the first Oaxacan journal, "El Correo del Sur" [Southern Courier]. 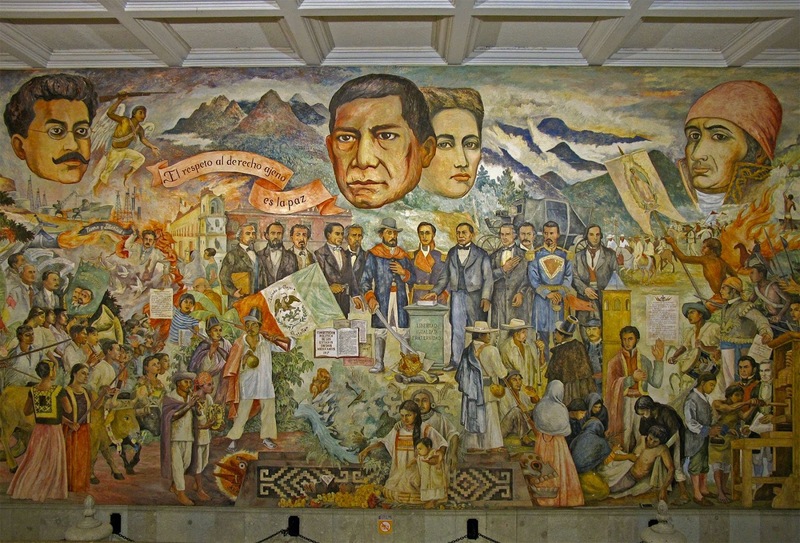 Other important Mexican heroes also appear here, such as: Benito Juárez, Margarita Maza, José Maria Morelos and Ricardo Flores Magon. Under the stairwell you can find the world's largest Tlayuda, 3 meters across and made from 120 kilos of masa. 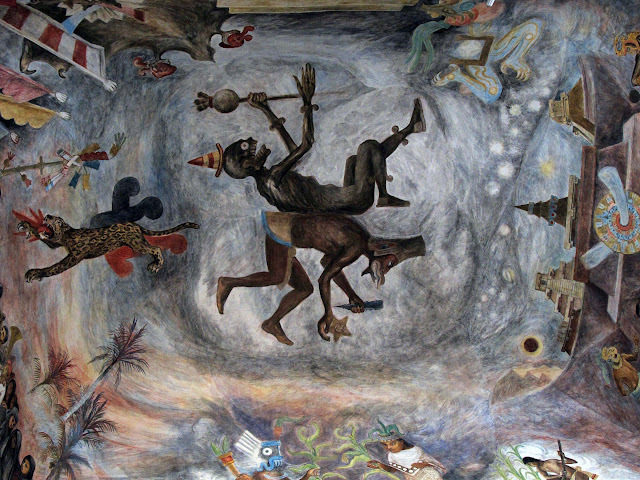 Likewise in the side stairs there is a second mural also painted by Arturo García Bustos in 1987 called Cosmogony of the indigenous peoples of Oaxaca. It covers the dome and walls of the staircase for the east patio and represents the formation of the universe, from the mythical view of the Hispanic cultures of Oaxaca. The central mural portrays water, fertility of the soil and education. 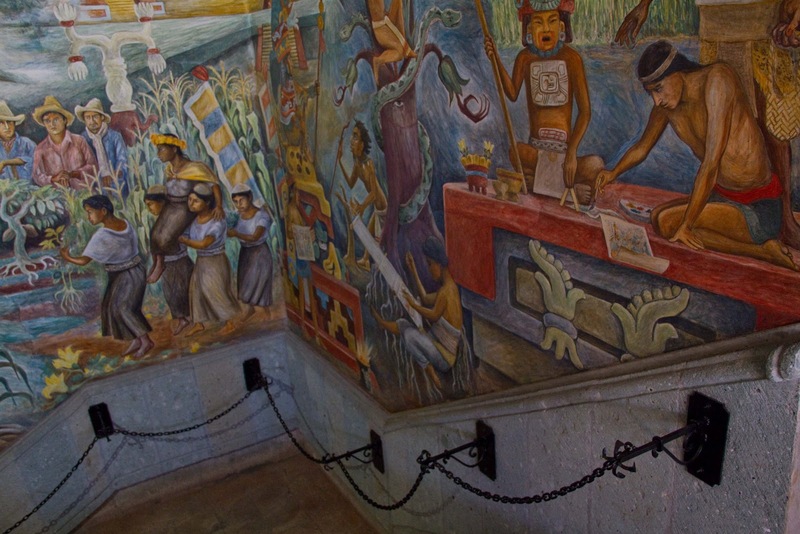 The mural on the right depicts the tree of life, a woman, naked from the waist up with her waist loom, a sorcerer or high priest, the huge Monte Albán Plaza, and a scribe painting some codex. The left mural shows daily life in the Isthmus, a day at a marketplace, as well as some Huave fishermen from San Mateo del Mar, with their nets and musical instruments. 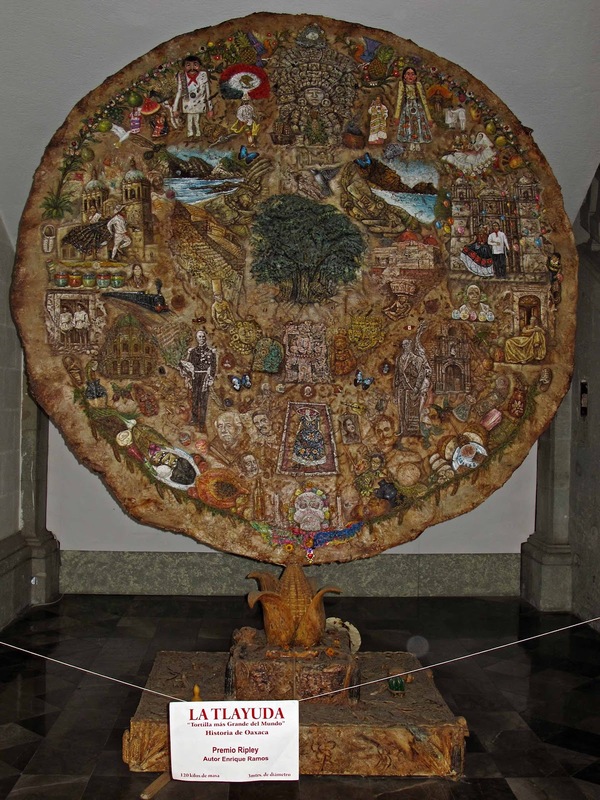 There is also a portrait of the Huautla de Jimenez area, represented by the goddess of the soil and two priestesses dressed in traditional Mazatec attire, known as a Huipil. 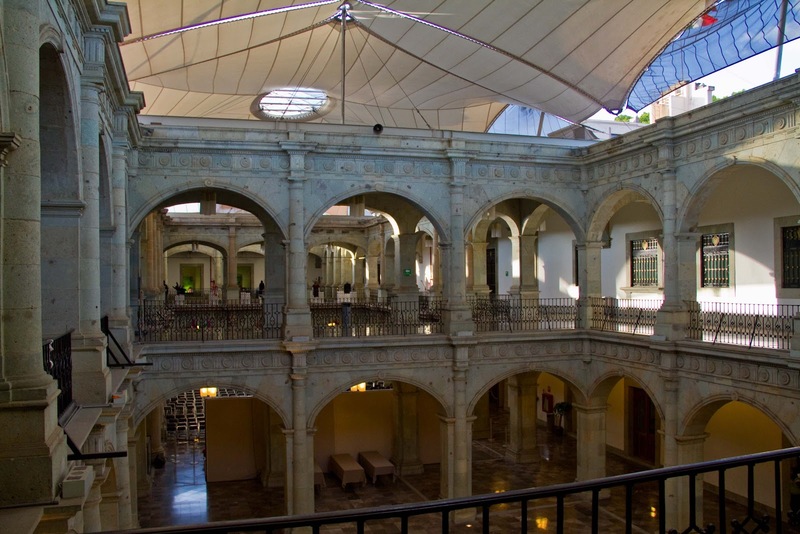 In another area you can find historical documents of the life and work of Benito Juarez. The space is also used for art exhibitions. Outside it continues to be a focal point for protests despite no longer being the seat of government. 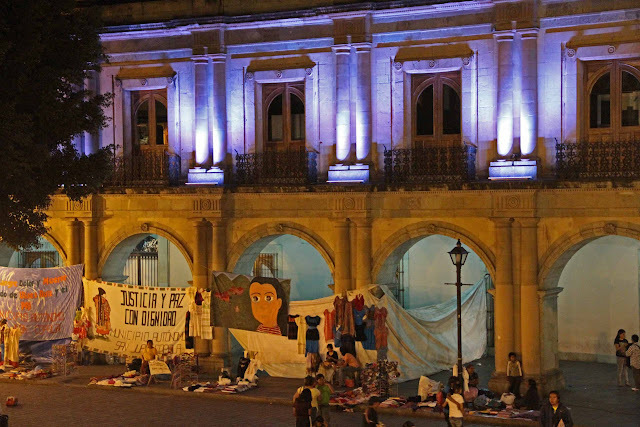 For the past 18 months the people of San Juan Copala have been camped here in protest. For an update of what the current protest is about go here: Oaxaca's "Occupier" Refugees Face Roadblocks on the Way Home. For more pictures of the interior and art exhibits go to my Picasa web album.